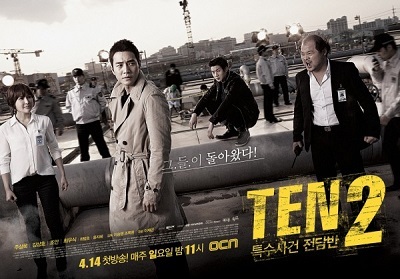 “Special Affairs Team TEN” is a criminal investigation unit that tackles the most violent crimes in South Korea. These crimes usually have less than a 10% rate for arrests. They chase the most notorious killers who attempt to commit the perfect crimes. Yeo Ji Hoon (Joo Sang Wook) is former top-notch detective, but now works as a professor. He then becomes the leader of Special Affairs Team TEN. He will lead this special crime unit. Baek Do Sik (Kim Sang Ho) is as good-natured veteran detective. He possesses a keen sense of intuition, which he honed from his many years as a detective. Nam Ye Ri (Jo An) has been a detective for 4 years. She joins Special Affairs Team TEN because of her psychological reasoning powers. Park Min Ho (Choi Woo Sik) is a new detective. He joins Special Affairs Team TEN after impressing Professor Yeo Ji Hoon with his reasoning powers. This entry was posted on Sunday, September 1st, 2013 at 6:35 PM	and tagged with choi woo shik, jo an, joo sang wook, kim sang ho, yoon ji hye and posted in 720p, Drama, Waiting To Be Watched. You can follow any responses to this entry through the RSS 2.0 feed.